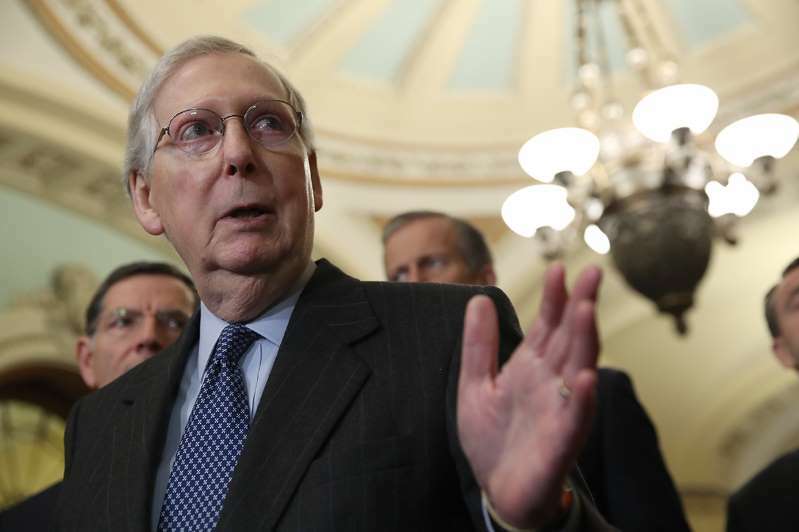 Republicans used a similar tactic last month when Senate Majority Leader Mitch McConnell brought the “Green New Deal” plan from freshman Rep. Alexandria Ocasio-Cortez (D-N.Y.) to the Senate floor for a vote to highlight Democrats’ disunity and portray them as out of step with Americans. But most Democrats voted present, deeming the vote a stunt. Senate Democrats on Wednesday brushed off the prospect that Republicans might try to corner them on a Medicare for All vote, pointing to a prior GOP maneuver that failed to land any serious blows. Sens. Chris Murphy (D-Conn.) and Sheldon Whitehouse (D-R.I.) made a similar prediction. Sen. Richard Blumenthal (D-Conn.), a co-sponsor of Sanders’ bill, agreed that a potential vote at this point would be a clear “stunt,” but said that if given the chance, he would vote in favor of it. The Medicare for All bill so far has 14 co-sponsors, including 2020 presidential candidates Sens. Kamala Harris (D-Calif.), Cory Booker (D-N.J.), Kirsten Gillibrand (D-N.Y.) and Elizabeth Warren (D-Mass.). The bill is among several Democratic proposals in the Senate to address expanding access to health care. McConnell has tried to bait Democrats on Medicare for All in the past, holding a vote in 2017 on a single-payer measure aimed at creating problems for vulnerable red-state Democrats. Nearly the entire Democratic conference, as well as Sanders, sat out the vote, which failed 0-57. But Democratic leadership has so far ignored the calls from the right and the left to bring the policy to the floor and has focused instead on broadly popular bills to improve and shore up the Affordable Care Act. Now, thanks to the Trump administration’s decision to change its position in an ongoing lawsuit and argue that the entire health law should be thrown out, the pressure has shifted back to Republicans, who are struggling to meet President Donald Trump’s demand for a replacement. With Senate Republicans’ health care leaders indicating that they have yet to even begin seriously discussing a new health care plan, the GOP is eager instead to put Medicare for All up for scrutiny. After the introduction of Medicare for All, the White House blasted the bill. “Self-proclaimed socialist Senator Bernie Sanders is proposing a total government takeover of healthcare that would actually hurt seniors, eliminate private health insurance for 180 million Americans, and cripple our economy and future generations with unprecedented debt,” the White House said. Senate Democrats expressed frustration this week that they could be put through that exercise yet again, though they overwhelmingly directed their ire at Republican leaders, not the Medicare for All advocates within their own party. Sen. Doug Jones of Alabama, who faces a tough reelection fight in 2020, spun the potential for a vote as a positive for Democrats who have enjoyed a clear political advantage on health care issues since the GOP’s failure to repeal Obamacare. The move would open up yet another opportunity for the party to contrast its slate of proposals expanding health coverage with Republicans’ continued lack of a coherent message. Still, Sanders’ high-profile rollout of his Medicare for All bill comes on the heels of the Trump administration’s renewed effort to eliminate Obamacare — threatening to reopen divisions among Democrats otherwise eager to circle the wagons in defense of the ACA. Trump in late March directed his Justice Department to throw its full support behind a legal effort to wipe out Obamacare and has since vowed to develop a new plan for replacing the health law. The surprise pivot to health care has panicked congressional Republicans eager to move on from the politically dangerous issue, which energized Democrats who ran — and won — nationwide on protecting Obamacare’s popular benefits in 2018, and believe they can do so again ahead of 2020. Sanders’ push for Medicare for All so soon afterward prompted some grumbling that it could disrupt the party’s unity on a key issue. Several Senate Democrats downplayed the significance of Sanders’ Wednesday rollout, portraying it as simply part of his nascent presidential campaign before trying to turn the focus to friendlier territory.